This project definitely looks promising. I'd imagine that getting compatibility for all of those games isn't an easy feat, even with help. However, if I may make one suggestion: please try to add collision editors for what's already there rather than focus on adding more tile editors. We can't do much if we can only change how the levels look. Can you provide the location of collision data in ROM file for level 1? I'll add physics layer editor with it. Sorry, I don't know where the collision data is. I'm a complete newcomer when it comes to ROM-hacking; I know how to patch files, but if I actually want to make anything myself, I need to rely on front-ends like level editors. P.S. 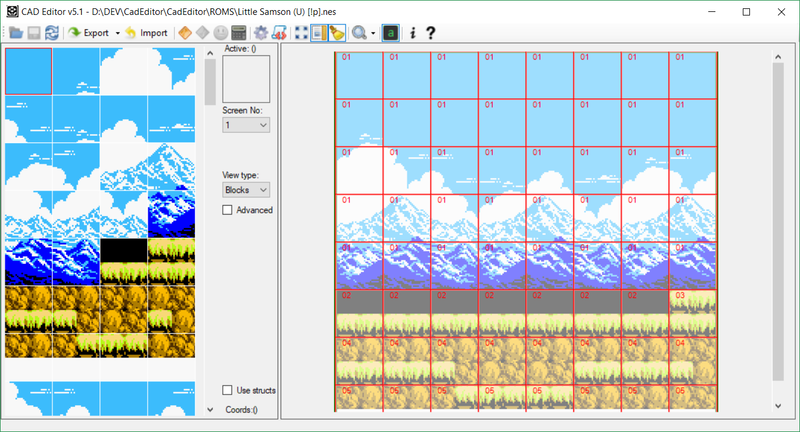 One bit of feedback that may be helpful: the current editor for Little Samson shows the final boss's room in the middle of stage 1 instead of the actual screen that goes there (and since the room is displayed with stage 1's tiles, it looks corrupted). 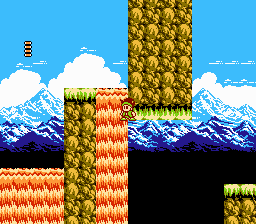 There are not many games with collision data at separate layer (little samson, battletoads/bt&dd, journey to silius, maybe 1-2 others from supported list), but I can add ability to describe and edit this layer for those games in next release, thanks. Awesome editor.. Keep going. Good job. By the way, I know it is NES editor but is Rockman Mega World aka Mega Man: The Wily Wars possibly ? 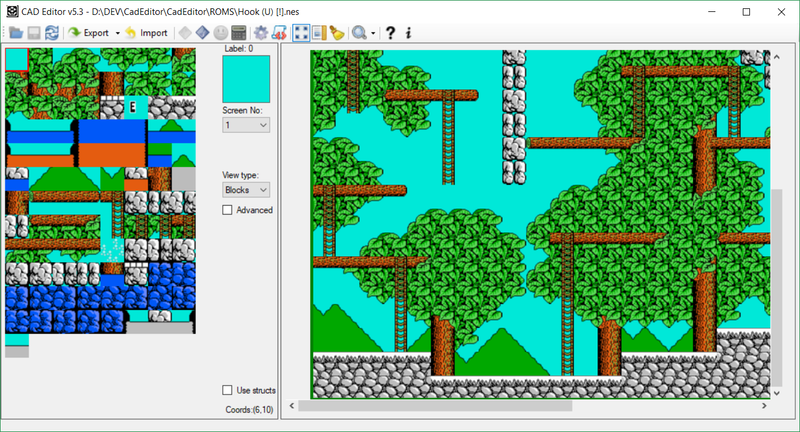 Or it will need someone to created a new Sega Genesis/Sega Mega editor for this game ? Awesome; now I just need to wait for the other levels to be added. By the way, if you plan on finishing the Little Samson plugin soon, can you add an option that changes where the player is sent after reaching the end of a level? I'd like to be able to make a hack that doesn't force the player to fight the same bosses as in the original game (without me having to learn assembly code). Editor has plugin for building SMD graphics, so it can be used for editing this game, but you need someone, who can make configs for it. I'll add this games to my list, but I have no time to develop editor for now. The way that some of these superheroes survive in the 8-16 bit games is that, even though they, or one can be reduced to low health, it is not completely annihilated. Some are even converted to non-human entities. It's very confusing to understand in visual aspects, but the sprites can be compressed and decompressed to work even in 32-bit or 64-bit graphics. Release with updates gui, support of physics layer (as in Little Samson) and Game Boy games (1 config only for 1 level of Darkwing Duck GB). This features will used in next releases. I know the update was a while ago, but I just wanted to say thanks for focusing on the Little Samson plugin. I hope more levels (and an enemy-placement layer) get added soon. P.S. Is it possible to make it so we can see/edit multiple screens at once? Maybe even with an option to let us move a screen within the editor (for UI convenience in case the level segment is vertical)? That way, we could combine it with the current zoom feature to see/edit the entire level. It's interesting UI task to view and edit multiple screens. Maybe I'll try to implement it with adding more scaling options. Also, it may be useful to save screens alignment and load it in layout editor (for enemy's editor) - now it's one of several options available from configs and I use it for some games when I did reverse, how layout stores in ROM file or no layout exists (Ninja Cats config, for example). ● That the file-opening menu can be resized and that the application separately remember the "Config file name:" and "ROM file name:" routes. ● Make it optional to resample the image in order to see the graphics in editor correctly. ● Give the possibility to configure or deactivate the transparent color that is activated when using the option "View type:" since sometimes it is difficult to distinguish some files. ● Make the preview of the "Blocks Editor" move to the bottom of the window so that it does not overlap with the palettes and that the Zoom option is incorporated. ● Tiles can be grouped by similarity and an option is incorporated to edit identical graphics at the same time. ● That when going through a graphic in the "Blocks Editor" it tells you its hexadecimal value. ● It would be great to integrate a clipboard to be able to "copy" and "paste" the configuration of the tiles to reuse them later. 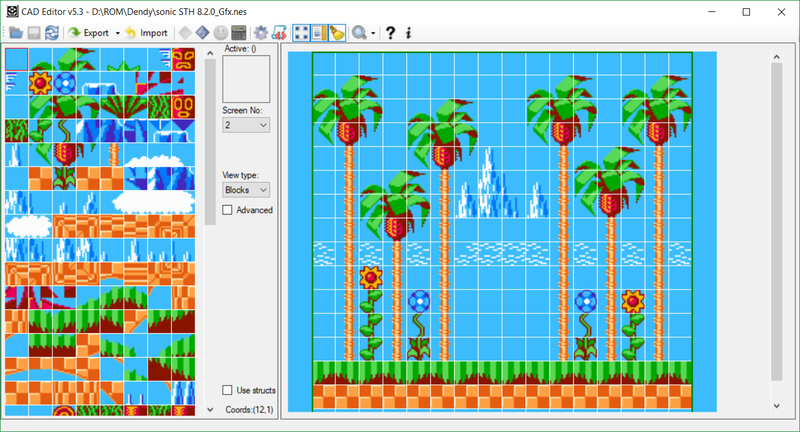 ● Another thing I look forward to is to integrate a "Pattern" menu like the YY-CHR for the "Blocks Editor", that would really make it much easier to create custom graphics. I send you private message with questions about several items. Thanks for proposals, some of them are really important for the editor. Also, please provide a full rom name or link to it for me. You need to make only one change - replace dumps of PPU memory and palette files. It will create files chr.bin and pal.bin. Next, rename this files to chr1-1(a).bin and pal1-1.bin (as I used in my configs) and replace files in settings_nes/sonic_the_hedgehog_unl directory. I made dump only for first part of the level - chr1-1(a).bin, you must add other dumps yourself - just walk the game while ppu content changed and dump it with my script again. You can change loaded ppu in the CadEditor with enable "Advanced" checkbox, and select VideoBlock combobox. If your have ppu banks as separate files already, you can just replace dumps my chrX-X(X).bin files with it. Sorry for mistakes in English, it's not my native. The game creates objects, with the objects level blocks are created and with the latter the actual levels are designed. ● This explanation takes as an example "Green Hill". 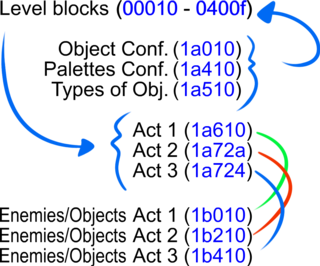 ● I really do not have a way to prove conclusively that the Offset belonging to the acts begin in the places indicated, but everything seems to indicate that this is the case. I understand that "Hummer Team" uses the same engine in almost all its games, so if this type of level were compatible it would open a new range of possibilities for users, on the other hand I think if I had any example of how to carry it out this type of configurations could replicate it in the rest of the levels.